" I am studying Aero-Mechanical Engineering at Strathclyde University. I choose engineering because you have the chance to solve complex issues through creative thinking and science. Both of which I am very good at and like doing! " " Being born and spending my childhood in a developing country, I understood how important of a role engineering plays in society and making a country prosperous from an early age. I wanted to solve many of the world’s problems such as the need for clean energy, clean drinking water and sustainable housing for the ever-increasing population. Combined with passion for science and maths, I decided to become an engineer – a superhero who will save people from their everyday problems! " " I am a 5th year Mechanical Engineering student with a desire to work in the oil and gas industry where I can use and improve the skills I’ve learned over my time at Strathclyde University and fulfil the energy demands of the modern world." " I am an Erasmus student from France and I came to study at the University of Strathclyde for my last semester. I am studying mechanical engineering and I choose this speciality so that I can develop new innovative objects and express my creativity! " 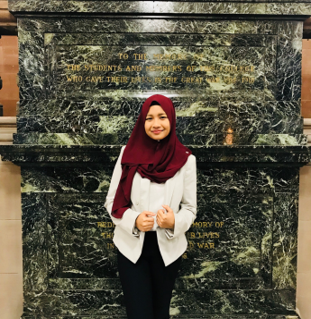 " I am from Malaysia and currently in my 5th year at University of Strathclyde. I chose engineering as I find it an interesting field where creativity and technical aspects are combined to solve daily issues and problems for the betterment of society. ​ "